To intervene in a planted park exacerbates the fact that the perception of any building will differ drastically through the seasons. Its presence will be more or less evident, made more or less pregnant. In no instance, should it ever be an unwelcome disturbance to the pre-existing balance. For that reason, the project cannot be a monolith. We thus propose to translate the programmatic and functional requirements of the brief into 3 delicate fragments of a scale not entirely foreign to the current ecosystem. They form an assemblage that is cemented by the park. Not an intruder, it seems as though the International Music Centre was always part of the village fabric that inhabits the ecological park. The bigger mass houses the main programmatic organ, the auditorium. It is directly oriented towards Chopin’s house. The second building constitutes the functional and physical heart of the composition: it accommodates the entrance to the complex, the chamber hall as well as the educational facilities and the offices. The necessary physical connections between these two fragments are facilitated by a virtually invisible 2-storey plinth embedded into the topography and that accommodates the parking on the lower level and the lobby, foyer and the rehearsal rooms on the semi-buried ground floor. The third component is a linear volume that sits parallel to the Utrata river and houses the conference centre. 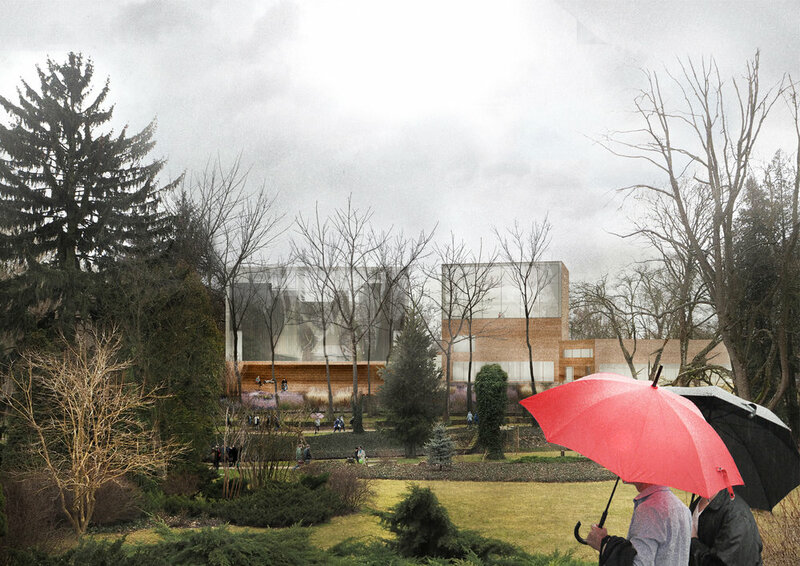 The proposed massing not only allows for the right scale of insertion of the project within the park; it invites the visitor to use the park between the fragments as the antechamber of the Music Centre. All public spaces such as the exhibition hall are directly accessible from the antechamber, creating a seamless relation between interior and exterior and offering the opportunity to use the park as an extension of the Music Centre where various outdoor events can be hosted. We propose the use of rammed earth as a main construction and finishing material for the International Music Centre.